Exquisite Cocktails have the pleasure of working with high-end brand, companies and organisation across the UK. On their travels Exquisite Cocktails have created themed bars and brought branded drinks to many different types in sizes of venues. Here are six cocktail venues perfect to celebrate any occasion. Spencer House was built 1756-66 for John, first Earl Spencer, an ancestor of Diana, Princess of Wales. Spencer House own website states that the house was “ the most ambitious aristocratic town houses ever built in London and is, today, the city’s only great eighteenth-century private palace to survive intact.” Situated in the heart of St. James’s, Spencer House is a short distance from Buckingham Palace and regular opens it doors to visitor. Exquisite Cocktails had the opportunity to host an event for Standard Bank, the largest bank group in South Africa. Spencer House’s backdrop and lavishly decorated rooms make the venue a prime location for corporate events. This 13th Century estates that boosts two golf courses and seven smaller listed building within the grounds of the main house. Brocket Hall is a tall red brick neoclassical house in a fine landscape setting with a Palladian bridge. The interior of the house is mostly not on a grand scale but the exceptions are the main staircase and the Grand Saloon that was decorated specifically for entertaining royalty. 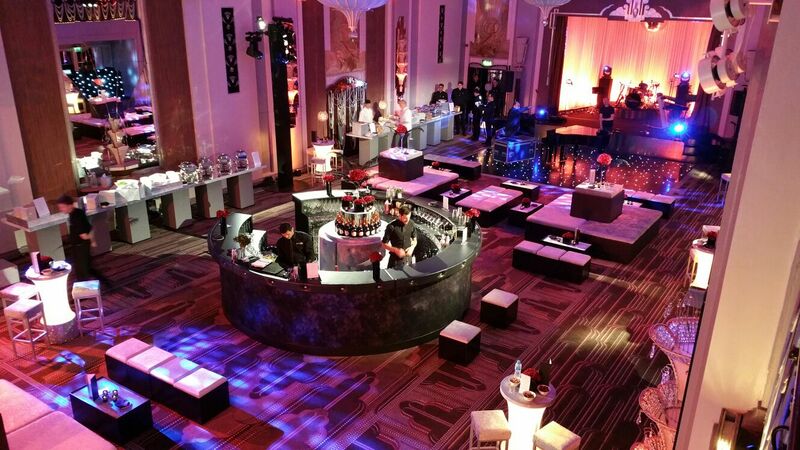 Exquisite Cocktails were very pleased to be part of an corporate event to ensure the drinks matched the location – exquisite! As highlighted in our recent blog post on ISES UK event that was hosted at the underground club The Egg. The rotation of global DJ’s spinning the metaphoric ‘wheels of steel’ most weekends and is firmly established in the London nightlife scene, Egg London has also proved itself as a successful corporate venue, playing host to many different private functions from intimate product launches with external garden and bar areas available for hire. Exquisite Cocktails recently provided hostess, Galacto bar, mixologist masterclasses and flairers with bespoke drinks on the night ensuring everybody was entertained. The Royal Exchange in London was founded in the 16th century by the merchant Thomas Gresham to act as a centre of commerce for the City of London. The original Royal Exchange building was completely destroyed by the Great Fire of London in 1666. As part of his rebuilding of London, Charles II laid the first foundation stone for the second exchange to be built on the site. The present Royal Exchange building, opened by Queen Victoria in 1844, was designed by the English architect Sir William Tite. The Royal Exchange has a range of additional event spaces to suit all requirements; both the Mezzanine Lounges and Courtyard spaces can be hired without shutting the venue exclusively and provide a stunning backdrop for corporate and private function parties. The Sculpture Gallery at Woburn Abbey offers a charming location for cocktail events. A classic yet contemporary facilities, the Sculpture Gallery offers private gardens, overlooking the Camellia lake makes for a beautiful location. Woburn Abbey is a historic house on the border of Buckinghamshire and Bedfordshire. The early 17th Century estate is home to host to weddings, concerts, corporate and private functions. Exquisite Cocktails have previously provided their mixologist and a bespoke bar at the Sculpture Gallery catering cocktails and champagne for a truly memorable event. The Ice Tank is a premier and very futuristic looking event space in Covent Garden. The space is perfectly designed for cocktail parties and can cater for private functions, fine dining, press releases and launch parties. The Ice Tank has 2500 sq ft space spread over two levels with 12 x 12ft door access into the main area of the studio. Amenities include wi-fi, stereo system, two plasma screens, an HD projector and even a fireplace. When Exquisite Cocktails were asked to host a bar for a VIP product launch the team flairers and mixologists brought their the lighters and talents for a truly jaw but not glass dropping show serving flaming shot, bespoke cocktails and champagne with canopies. Part of Exquisite Cocktails core service is that within any proposal there is a strategy that sees the aesthetics of each venue to bring about a perfect solution for each event to create a truly exquisite cocktail experience.